For my birthday I was gifted a Clarisonic Mia Smart! I had done some research before asking for this and I had seen Stephanie Toms’ YouTube review on the device which she had been sent in PR. I liked the look of it and I wanted to try it! 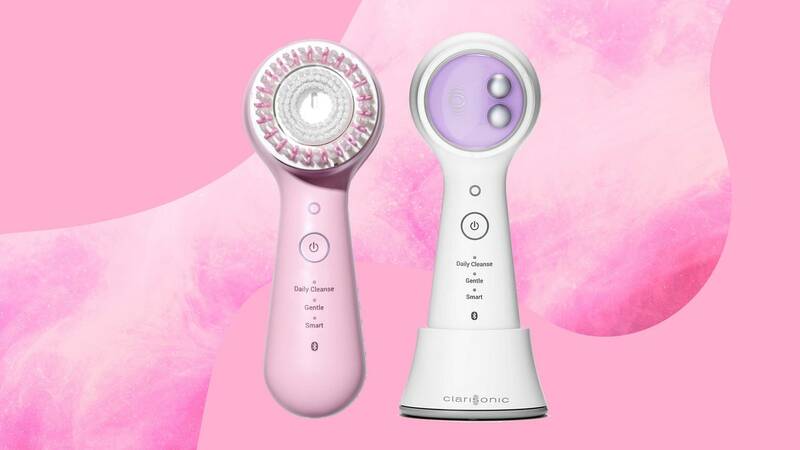 The Clarisonic Mia Smart is the big sister of the Mia Prima, and although this means it comes with a bigger price tag, it also means it boasts some pretty funky features that the Mia Prima cannot. The Mia Smart describes itself as the “one device that does all” with multiple attachments that can cleanse, massage, and even blend out your makeup. It comes in three colours, white, pink or mint and comes with the standard Daily Radiance Brush Head. When unboxing your Mia Smart, it recommends that you charge it fully before its first use. For 100% charge which lasts for 10 hours of use, they recommend a charge time of 18 hours. But, there is no need to guess, as with this smart little device comes a smart little app! The Clarisonic app shows your battery life, number of cleanses, and other statistics. It can send you reminders at specific times that fit with your routine for when you want to cleanse and shows your achievements such as cleansing streaks, completing a full foundation blending routine and (impressively) when your device has completed 300K oscillations (it has gone round 300,000 times)! You can also sync your own personalised skin routines to your device, so when you are cleansing it will beep when its time for you to move to another part of your face. I own the Daily Radiance Brush Head and the Sensitive Brush Head. The Daily Radiance is gentle as it is, but after a few days of using the device, once in the morning and once at night, you can feel how a sensitive brush head would be more gentle. Using the Mia Smart twice daily may be too much for your skin, so the app can customise its notifications and how intense the brushing is. As you can see from the screenshot, I have mine at intensity level one but it can go up to level four, which from what I have tried is a more ‘abrasive’ yet still gentle cleanse. If you are wearing stubborn makeup or have a lot of dry, dead skin, this may be suitable for one off use, but I’m not sure I would recommend using it on level four for extended periods of time. I have fairly sensitive skin and although there’s nothing I love more than freshly exfoliated skin and scrubbing hard, I also am very gentle with my skin as I know it can only take so much harshness. My favourite cleanser at the moment is the Clinique Liquid Face Soap in Mild. Reasons I love this; there are no harsh chemicals and it is gentle on the skin meaning I can use it twice daily and it won’t be too harsh. It also comes in Extra Mild, Mild and Oily, meaning there are different soaps to suit your skin type. I am also testing the Clinique All About Eyes eye cream at the moment, and I haven’t really used it for long enough to report long term results, but instant effects show less puffiness and brighter under eyes. The great thing about this is even though it’s a small pot, it takes the smallest amount for each eye, so the pot will last for a long time! I am also experimenting the Medik8 Calmwise Serum, which targets and combats redness and soothes irritated sensitive skin. I have a fair amount of redness, especially on my nose, cheeks and between my brows, so I am using this to see if any long term effects will come from it! I love the consistence, although it is an oil, it doesn’t leave my skin oily, just smooth. It also doesn’t use a lot for a full face application, so although it is a bit pricey, you can be economical with applying it! From the same company, I am also using the Calmwise Colour Correct moisturiser, which comes out green and combats redness directly by being the contrasting colour of red. This blends so beautifully into the skin, I just use my fingers to apply this and rub it in. Unlike some colour correcting concealers or primers, it is a moisturiser so it really leaves your skin hydrated and on top of that, it also instantly combats redness, reducing the pigment in your skin, to even out your skin tone. Again, although a little pricey, a little goes a long way, so it should last you a while! I hope you have enjoyed this blog post, and I will keep you updated with the different routines I experiment with using the Clarisonic. I hope to get one of the massaging brush heads and the foundation brush at some point, so hopefully I will review those as and when I get them! In the mean time, check out some of my other posts, where I have recommended some skiing skincare (because the season isn’t over quite yet!) and some fab cocktails which I loved!